As an amateur photographer, I absolutely love this program. I am sure you have come across the situation whereby you wanted to take the picture of a beautiful landscape or building but it just didn't fit in. Well just take loads of pictures and use "hugin" - the Free downloadable Panorama photo sticker to join up all your photographs into one whole complete panorama. The latest version is version 0.7 beta 4 and is available for Linux, OS X and Windows. 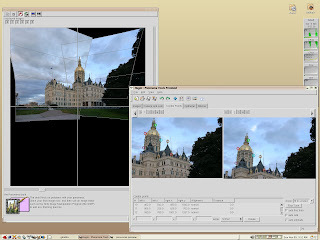 Here is a screenshot of the software in action from the Hugin site.